I absolutely love popcorn. Making popcorn at home brings me memories of the movie theater without having to pay too much. It’s one of favorite snacks and I almost definitely eat too much of it. Its my go to for movie nights, parties or even midnight snacks. 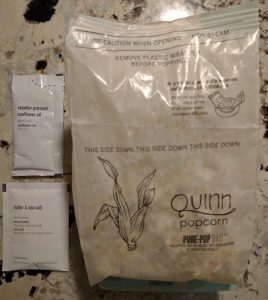 There’s certainly a few different ways of going about making popcorn, but the fastest and easiest has always been microwave popcorn bags. 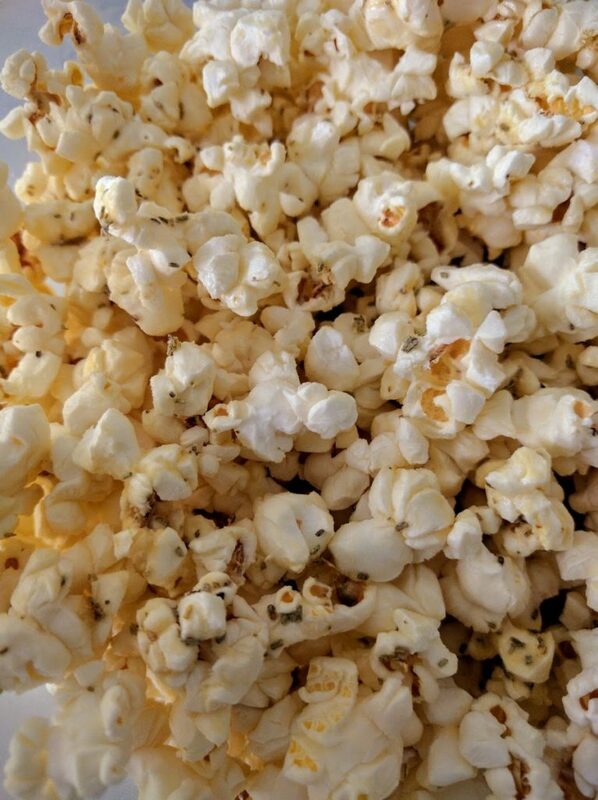 Just throw a bag in the microwave for a couple minutes and you get to enjoy some delicious popcorn with little to cleanup (just don’t over-microwave it or you’ll end up having to deal with a burnt mess!). Luckily for you, we’ve been obsessed and decided to find the best microwave popcorn, whether its buttered, low-fat or natural. 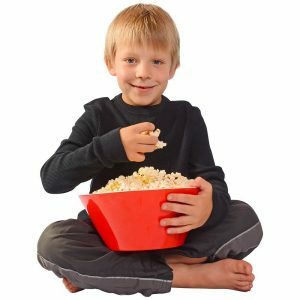 Before we start diving into what microwave popcorn to buy, some of you might want to know what seasoning or toppings are the best to throw on top. Most microwave popcorn is already buttered to some extent, but if you want that real movie theater flavor there’s a couple things you can do. For anyone who has worked in a movie theater, some of you might be familiar with Flavacol. This salt is often added when cooking popcorn at the theaters to give it that distinct taste. Sprinkle a bit of this on top and you’ll immediately remember that flavor you’ve been missing. It is also very low in calories and the flavor is very intense so you only need to add a little bit of the salt. The texture is much finer than standard table salt and is almost powder-like, allowing it to stick to popcorn better. 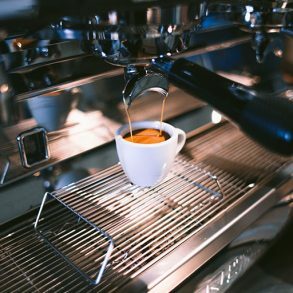 This means that a box or two of Flavacol is basically a lifetime supply since you only need to add a very small amount. In terms of nutritional value, be aware of the daily percentage of sodium in this. Anyone with concerns about high blood pressure should be careful with how much salt they consume. Also be aware that this salt is not iodized so be sure to get some regular iodized table salt in your diet. Outside of popcorn salt, one of our favorite popcorn seasonings is the Kernel Season’s White Cheddar Seasoning. This deliciously cheesy seasoning is gluten free, Kosher certified with no MSG and trans-fat. It is made with real cheddar cheese and tastes great not only on popcorn, but on veggies, pasta, salad and eggs. 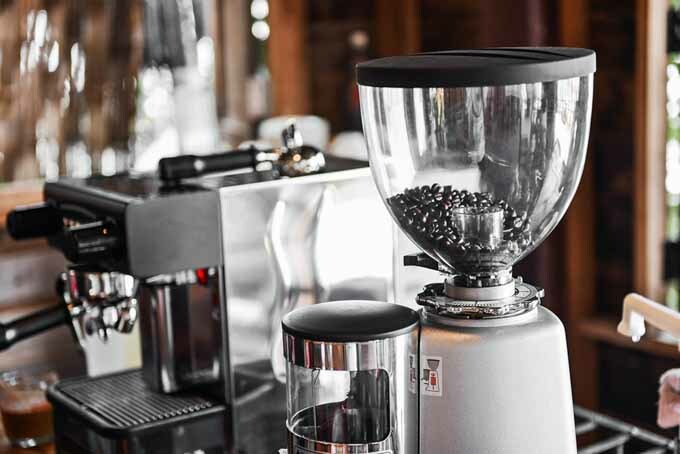 You use it like a shaker bottle and dust your food with as much as you want. It doesn’t leave a sticky residue (like Cheetos seasoning) and is quite light and fluffy. Combines really well with buttered popcorn. 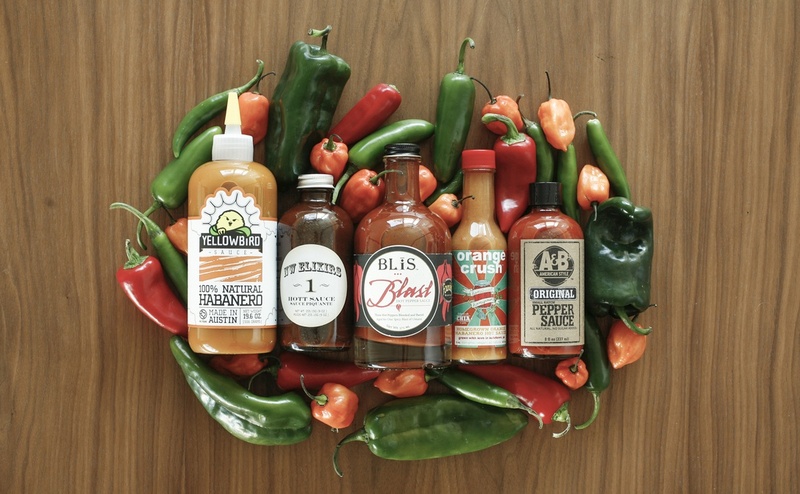 If you’re in a more adventurous mood, take a look at the other Kernel Season’s flavors including their seasoning kit. 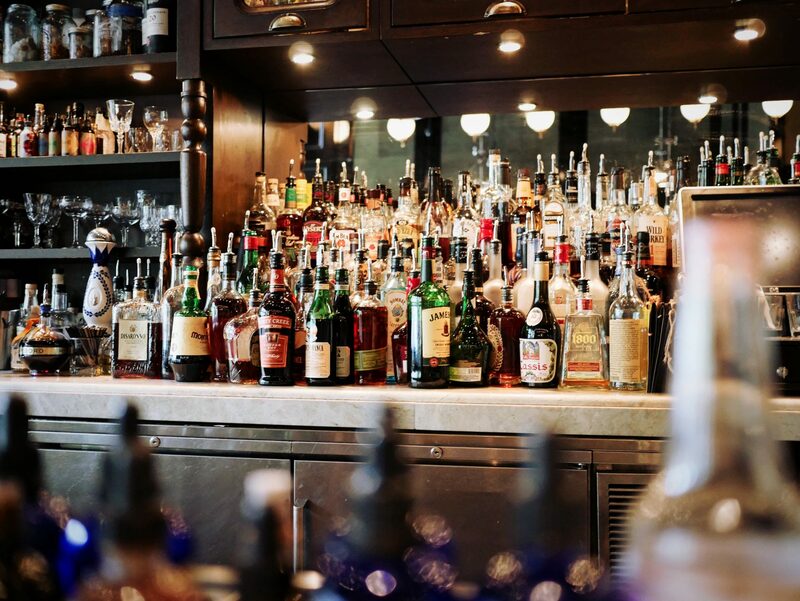 Their flavors includes nacho cheddar, garlic parmesan, butter, buffalo wing, cheesy jalapeno, ranch, kettle corn, caramel, milk chocolate caramel, white cheddar, bacon cheddar and popcorn salt. 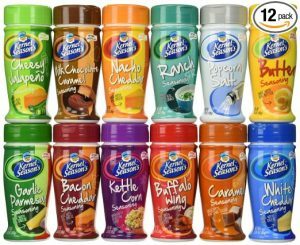 Our second favorite flavor is ranch as it goes well with popcorn but many other foods too. What you want in a bag of popcorn is a tasteful balance between butteriness, saltiness, fluffiness and overall flavor. We recommend Pop Secret Homestyle Popcorn as the best overall microwave popcorn with the best combination of these factors. 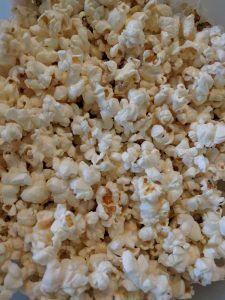 This is the type of popcorn that will remind you how good microwave popcorn can be and tastes light and fluffy like real air popped popcorn with a bit of added salt and butter. After eating this it will definitely become one of your favorite microwave popcorn brands. The nice thing is that it also comes in a few different varieties each with different amounts of butter and salt depending on your craving. 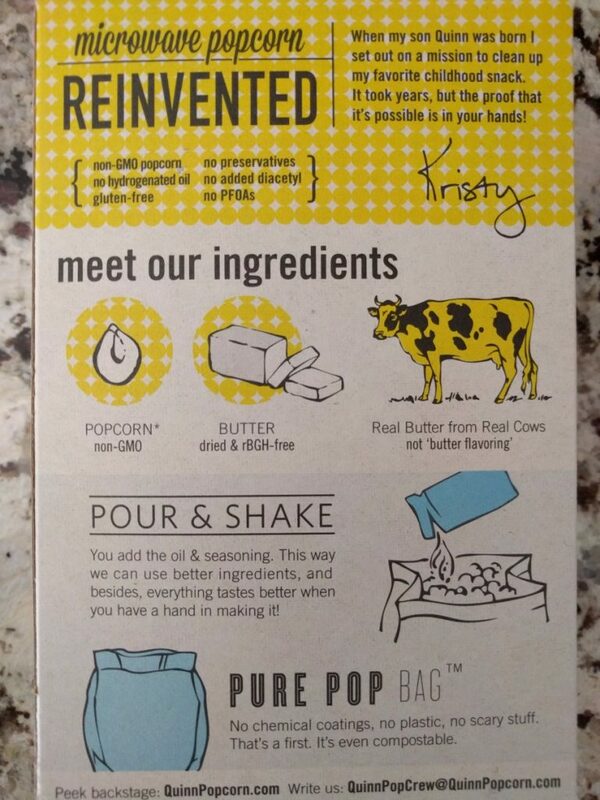 If you’re looking for that real movie theater butteriness, try their Pop Secret Movie Theater Butter Popcorn. 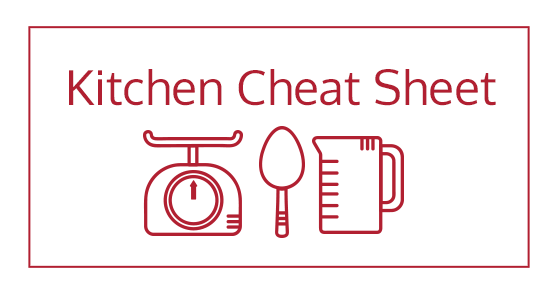 We found Pop Secret to cook reliably without burning easily or having too many unpopped kernels leftover, which is important because any unpopped kernels is just wasted money. We also never found the popcorn to be stale or chewy but consistently tasted fresh through 3 different boxes we tried over the past year. 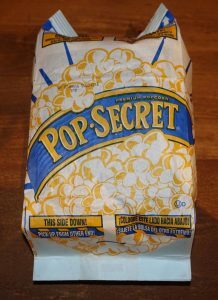 You want popcorn to taste light and fresh with a crisp crunch whenever you pop some in your mouth, and we are happy that Pop Secret is doing it right where many other store brands fail badly. Our second recommendation is the Kirkland Signature Microwave Popcorn. Kirkland Signature products have always been a reliable brand and they succeeded here with this microwave popcorn. After consuming an entire 44 box of these I can say that the taste has been consistently good, crispy and light. 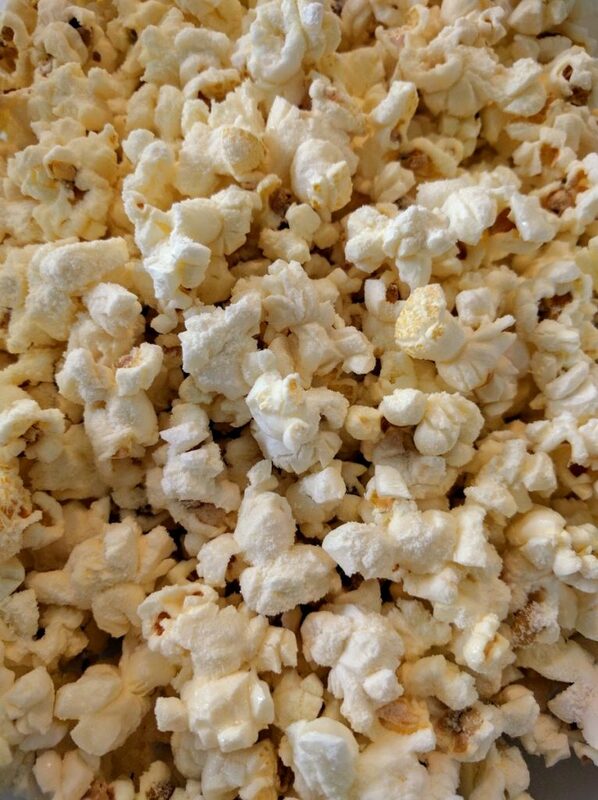 Not many kernels leftover after microwaving and a good balance of salt, fluffiness and butter. Not too greasy but full of flavor and great for movie nights. 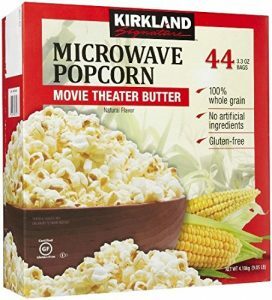 In fact, I thought the Kirkland microwave popcorn would be good, but didn’t know it would be this good and better than many other well-known popcorn brands. Try it out and enjoy. While we tried over 20 different types of microwave popcorn, we’re gonna going to mention a few that we didn’t like. 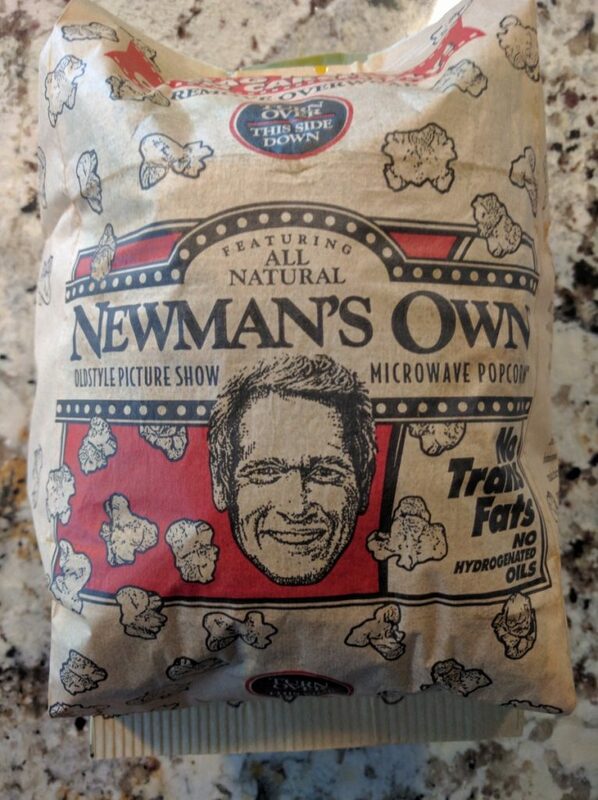 One example was Newman’s Own OldStyle Picture Show Microwave Popcorn. If we had to rate it, we’d give it at 6/10. Its a bit overpriced with a mediocre and rather bland taste and wasn’t very fluffy with little popcorn flavor. The butter taste was inconsistent throughout although at least it didn’t feel too greasy. I remember when I was younger it used to taste much better, so its possible they’ve started using cheaper ingredients. For the price, definitely not worth it. In terms of healthy microwave popcorn, to be honest there isn’t much to choose from. Most microwave popcorn isn’t the healthiest for you in the first place, and air-popped popcorn would be preferable. But there is one particular brand that has taken upon themselves to improve the health aspects of microwave popcorn and that would be Quinn Snacks Microwave Popcorn. The biggest drawback is that their microwave popcorn is quite expensive per package, but it is very tasty. Its great for anyone who is health conscious and would like the occasional bag of microwave popcorn to enjoy. If you’d like to try it out without spending much, we suggest picking up a single box that contains 2 packs of their popcorn. There’s a few reasons why Quinn has begun to make a name for themselves in the healthy snacks market. Their popcorn bags only use certified organic popcorn kernels that are GMO-free, gluten-free and grown in the USA. 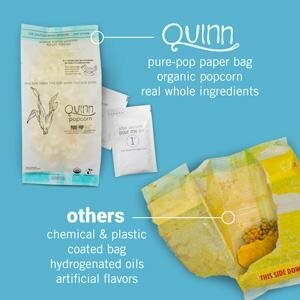 They also use high oleic sunflower oil and popcorn bags that are 100% recyclable and compostable. Their ingredients are simple with no diacetyl, no trans-fat, no hydrogenated oils, no artificial ingredients, preservatives and no PFOA or PFC. It is a tasty, simple and clean snack that you can eat without worrying about any chemicals or additives. 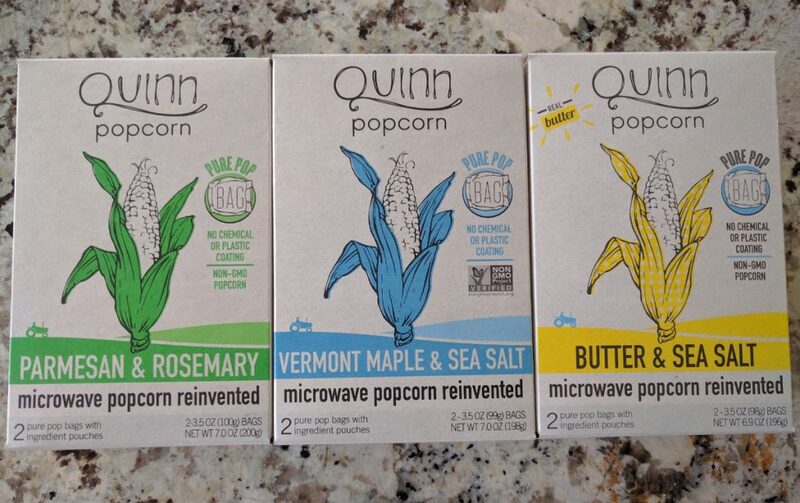 For part of this review we picked up a Quinn 3 pack that includes Butter & Sea Salt, Parmesan & Rosemary and Vermont Maple & Sea Salt. 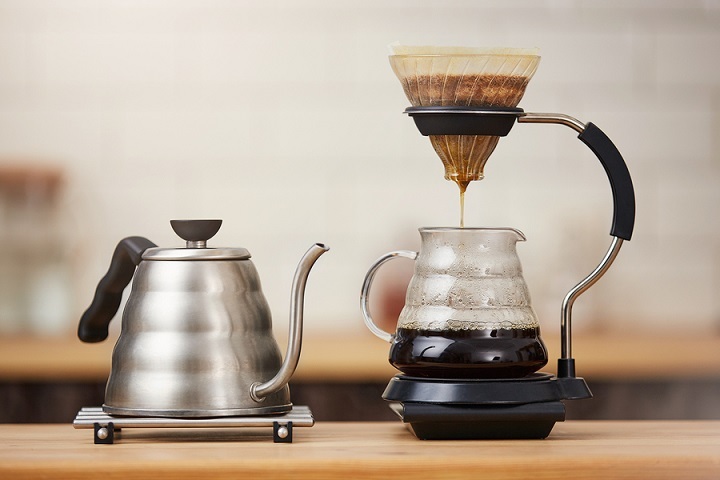 Each offers a distinct flavor that comes together when you add the separate spice pouch and oil pouch that each package comes with. Simply microwave the bag first, open it up and add both pouches and shake the bag to mix the seasoning and oil evenly. The cheapest of the three is the Quinn Popcorn Butter and Sea Salt. It tastes outstanding with good flavoring. The butter/salt powder and oil combine to stick evenly throughout. The popcorn was fluffy with a good crunch and tasted fresh. We recommend using the highest power on your microwave since the first time we cooked it there were quite a few kernels that did not pop. Ingredients: Certified organic popcorn kernels, high oleic sunflower oil, butter powder (cream, salt, buttermilk), sea salt. Our favorite flavor is actually the Parmesan and Rosemary due to the uniq ue taste and smell it gives off. Again the kernels were soft and crunchy but not too crispy. The rosemary taste and smell is very strong so make sure that you love rosemary. very, very strong rosemary taste/smell. The cheese tastes real and combines really well with the rosemary. 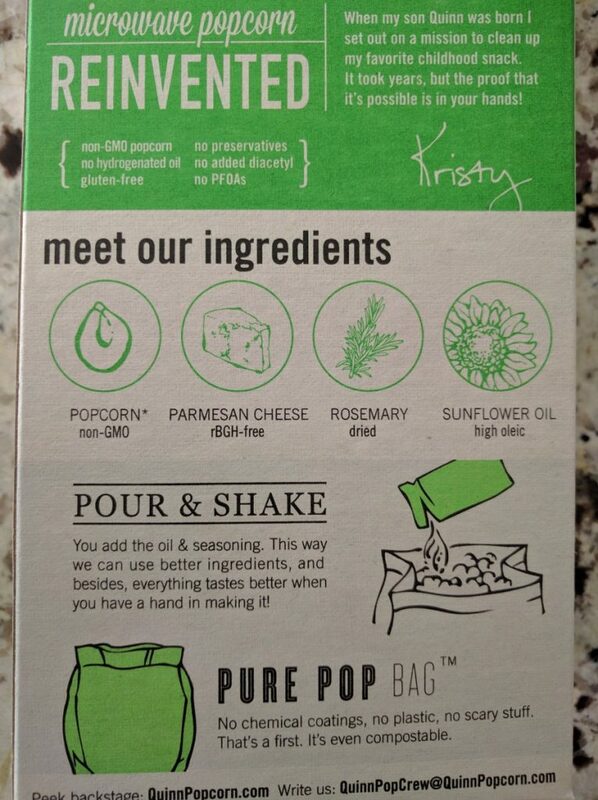 Ingredients: Certified organic popcorn kernels, high oleic sunflower oil, parmesan cheese (whole milk, cultures, salt, enzymes), dried rosemary, sea salt. The third one we tried was the Vermont Maple & Sea Salt which offers an excellent mix between sweet and salty. This one is great for offering to guests or whenever you’re craving a bit of sugar. The maple syrup flavor is strong but tasty and reminds you of a pancake breakfast. 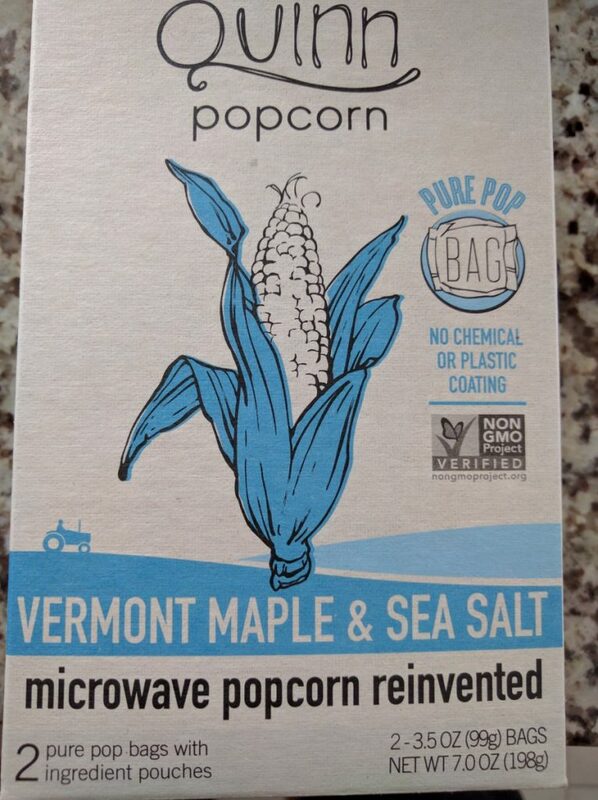 Ingredients: Certified organic popcorn kernels, high oleic sunflower oil, maple sugar, sea salt. 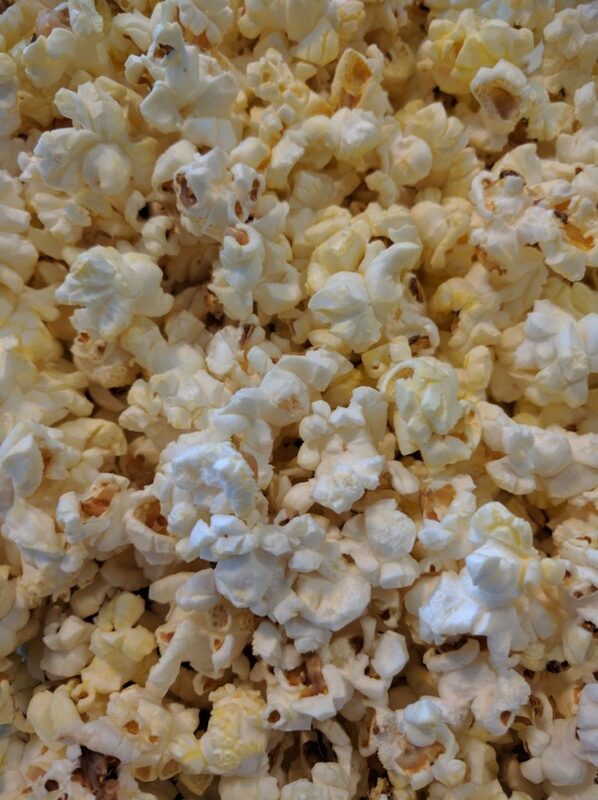 We consider natural popcorn to have very minimal seasoning to leave the natural popcorn flavor. 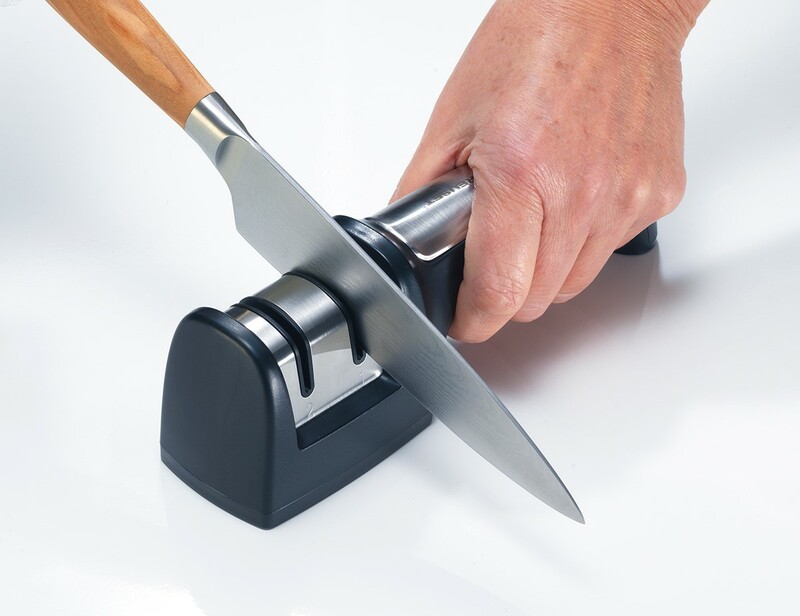 It’s for anyone who prefers to season their popcorn the way they like without it being drenched in artificial butter. Don’t get confused if a popcorn box says whole grain because all popcorn is whole grain otherwise it would not pop. 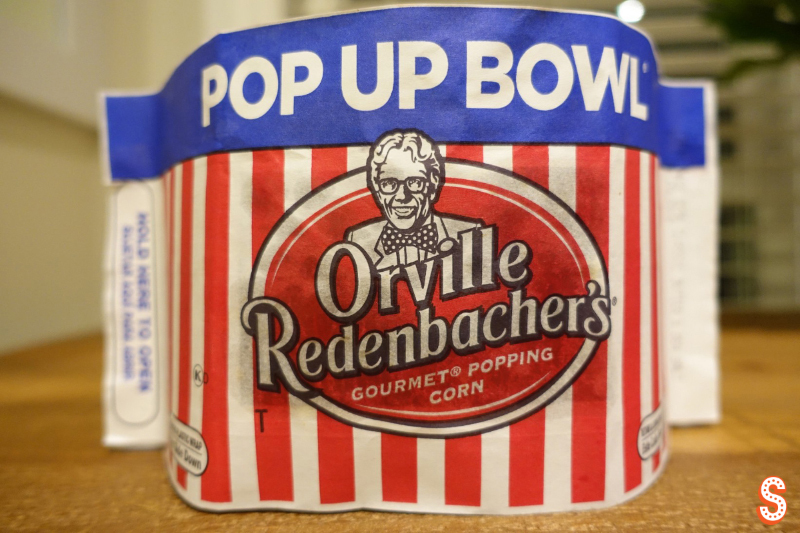 We recommend Orville Redenbacher’s Naturals Light Classic for the great natural taste that comes in its own convenient pop-up bowl. 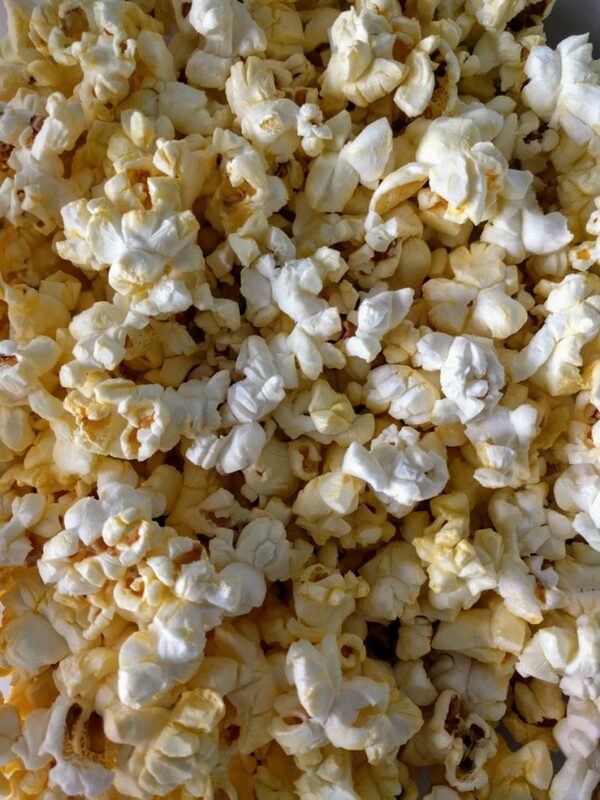 The popcorn has very minimal flavoring and is great for adding a bit of seasoning to make it taste the way you like. The popcorn was light and crispy and quite fresh tasting. 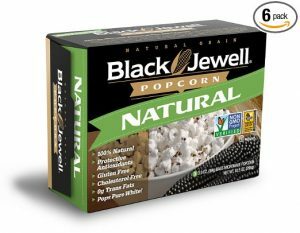 Another fantastic natural popcorn is the Black Jewell Premium Natural Microwave Popcorn. It has a really delicious crunch and pops pure white with less hull than other microwave popcorn. You won’t have the issue of getting the hulls stuck in your teeth anymore. The taste is flavorful and simple with smaller kernels (due to less hull) and comes lightly salted. Fantastic for adding your own butter and any other seasoning or powder. Just make sure to listen carefully when microwaving and to be diligent because it will pop faster than other brands and might burn if you’re not paying attention. 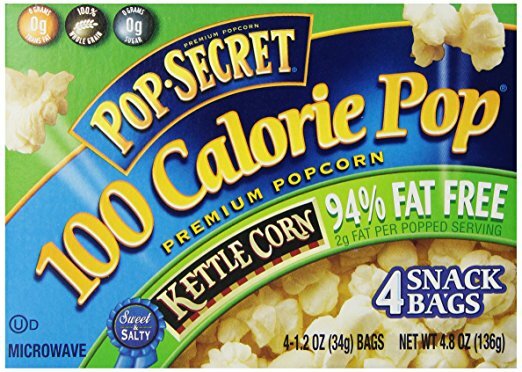 For those who are calories conscious and would like to enjoy popcorn without wrecking their macros, we highly recommend the Pop Secret 94% Fat Free Butter Popcorn as the best low fat microwave popcorn. One single popped bag is roughly 100 calories which is useful for portion control and adding a bit of fiber to your diet (12% daily value). The flavor and calorie compromise is very reasonable and offers a nice, salty and buttery taste without feeling guilty. Remember these are snack sized, so lower the amount of time you would normally use for a bag of popcorn in your microwave (we used 1 minute 30 seconds) otherwise it can burn easily due to the smaller bag and amount of kernels. Our runner-up is the Jolly Time Healthy Pop Butter with 94% Fat. It makes 12.5 cups popped with each cup 20 calories, meaning one bag is 250 calories (I really hate how sneaky some brands get with calculating their calories). The portions are larger than the Pop Secret snack bag and the amount of butter to calories ratio is quite good too. The bag popped really well and made a standard large portion, although it tasted a bit dry but was still quite tasty and filling. Our only concern is with some reports that there is some inconsistent quality control with a number of popcorn bags in a box being defective. 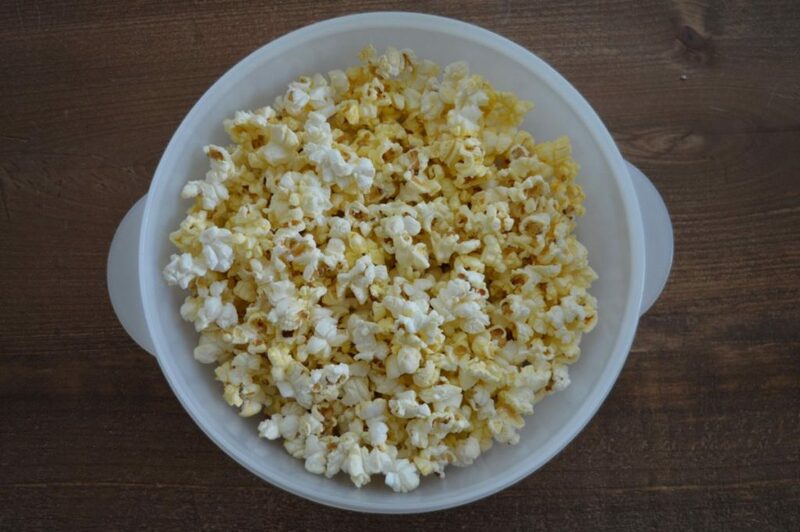 While any large bowl will do, popcorn bowls are always fun to have on hand. 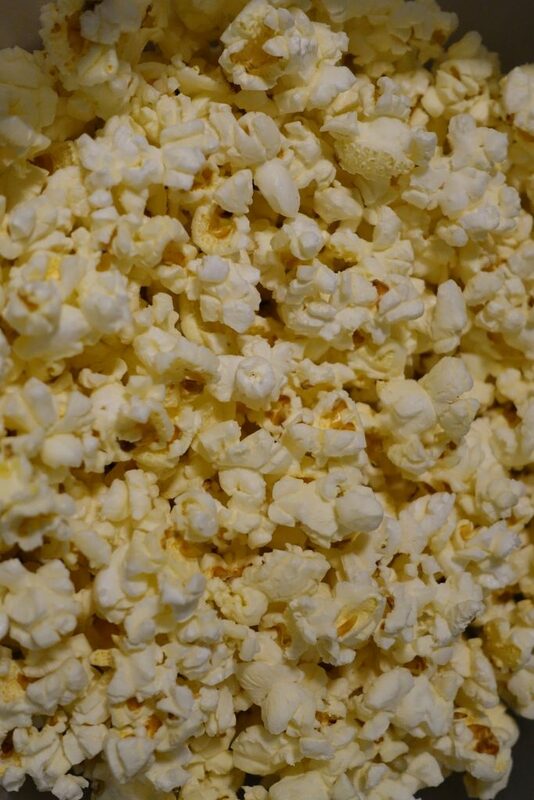 You can throw your popcorn in and add on any additional seasonings or butter on top and mix it in. Popcorn bowls should be inexpensive, hold at least one bag of popcorn, and should be light and durable enough to withstand accidental drops on the floor (which will happen at some point). Pictured above, we picked this big red popcorn bowl to be the best popcorn bowl we could find. Its a simple, large, plastic bowl with a colorful popcorn print on the inside. Its surprisingly sturdy and stylish and kids will love eating popcorn out of these. It also works great if you plan to make a popcorn gift basket and want to wrap everything within it. One thing to note, however, is that the bowl is made out of melamine plastic which is safe to eat from but is not microwave safe. Cook your popcorn separately, throw them in here and mix with any other seasonings to enjoy! 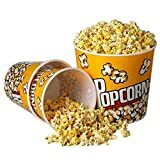 Set of 3 Fun Movie Theater Style Plastic Popcorn Tubs - 8"-7.75"
An even cheaper but fun alternative are these plastic (BPA-free) movie theater style popcorn tubs (set of 3). These are awesome for movie nights if everyone wants to have their own popcorn tub with their own seasonings or butter. Bring that movie theater atmosphere right into your own home! 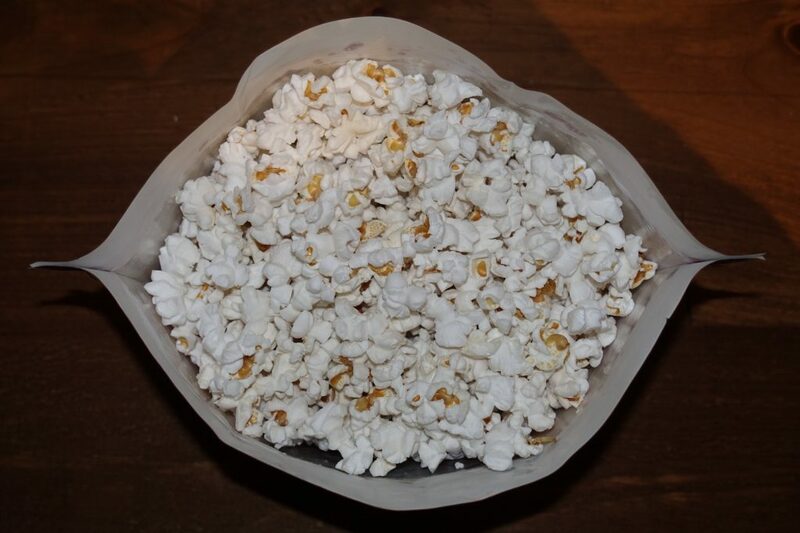 These popcorn tubs are big, light, durable and reusable. Great for parties or making fun gift baskets.